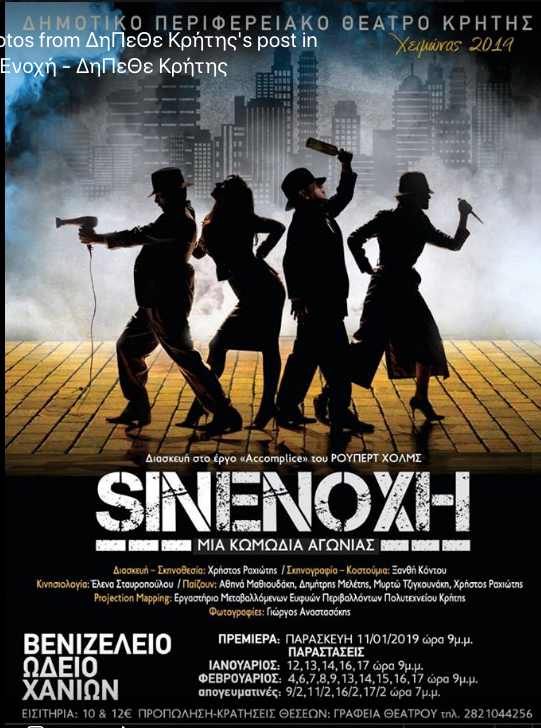 The Municipal Regional Theatre of Crete presents the second cycle of performances of this comedy thriller, which is an adaptation of “Accomplice” by Robert Holmes, winner of the “Edgar” award (the “Oscar” of crime and suspense). The humorous, odd, scary and highly dramatic comedy thriller begins as a conventional English thriller set in a country house where a wife and her lover plan to murder her stuffy husband. WHEN: 4th – 17th February 21.00, for details see below. The performance can be attended by people over 15. 12 € and 10 € (students, unemployed, over 65, 67% disabled). tel. 2821044256-2821023333 during working days and working hours. “This is a sinister mystery with elements of thriller and black comedy that reminds us of the genre film noir“.